From time to time, clients of my Thailand golf travel company, after visiting Thailand for a golfing holiday, tell me that they so love the country, its culture and its people, and naturally the golf that they would like to retire to live permanently in Thailand. This is good news for me, as I take personal pride in knowing that others can enjoy the rest of their lives here, and the seed for this decision was initially planted or prompted by them having a memorable Thailand golf vacation. In the next two postings, I will address some things to consider if you are considering a move to Thailand. If you are going to retire in Thailand and if you are over 50 years of age you should obtain a Retirement Visa. It’s that simple. If you don’t then you will be doing a "visa run" every month like tens of thousands of other foreigners. What is a “visa run”? It is the practice of making a trip outside of the country for the sole intention to get your passport stamped. It is time consuming, costly if you have to do it every month, and just a nuisance. Visa runs are only partially legal and the rules keep changing. The new immigration law put into effect recently limits you to three entries. Then you have to return home for three months, apply for a tourist visa and start the process all over again. For a more practical approach, you should apply for a Non-Immigrant Retirement Visa before you enter Thailand. Permission will be granted for a 90 day entry for the first permit (single entry), but you can apply for a multiple entry one year stay in Thailand from the date of your arrival. This will automatically be granted, provided that you meet 3 criteria. 1. You have 800,000 baht (US$24,500) in a Thai bank, or an income of 60,000 baht (US$1,800) per month, or a combination of the two. 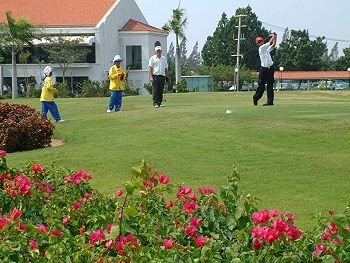 if you do not have the funds, you can sell your country club membership at home, send the proceeds to yourself in Thailand, buy a Thailand golf club membership, and you will have sufficient funds left over to show for your retirement visa. 2. You have no infectious disease, and have not suffered such a disease for over 3 months with the sole exception being made for those addicted to golf as this is considered unavoidable in Thailand. 3. You have no criminal record, other than golfing three times a week! It normally takes 3-4weeks to obtain the Retirement Visa from the time your completed application and fee is sent to the Royal Thai Embassy in your home country. Once you are in Thailand, you go to the Immigration Office every 90 days to let them know of your whereabouts. Prior to the completion of your one year stay period, an extension for another year can be obtained at the Immigration Office. This can continue year by year and indefinitely. In the next post, I will discuss buying property in Thailand, and other issues that you should consider before relocating here. In the meantime, if anyone has any recent experience of retiring to Thailand, I would be interested to hear from you. Please feel free to drop me an email at my Thailand golf vacation company.